Q: What are the differences between the TV Version and the Web Series Version? 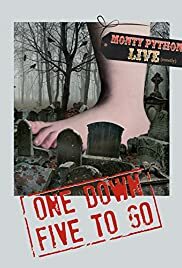 The Pythons are in their 70s, they have been one man down for 25 years and they have got back together one last time to make a lot of dosh and help pay for John Cleese's recent divorce. The last night at the O2 was simulcast around the world and nearly live on British television, I say nearly live so for the early part of the show broadcast in the early evening, the swearing was bleeped out. The unedited version went out the next day. So here are the remaining Pythons, older croakier and a few with forgetful memories. Terry Jones is the worse with memory issues but old age and ill health catches with us all. Eric Idle is still energetic and he gets to sing his catchy songs including looking at the brighter side of life. Terry Gilliam known with the Pythons more for his animation and better known these days as a director and battling to raise money to make films throws himself with gusto at the sketches. As with Idle he is giving 100% commitment, his movements are just more snappier as if to tell the rest of the team that he has still got it and tell Hollywood to give him more money to make the movies that he wants to make. Eddie Izzard and Mike Myers turn up for a spin as fan-boys and Carol Cleveland helps out with the sketches just like in the old days. It's been a while since I have since the TV shows and I have never seen videos of their live shows such as Live from The Hollywood Bowl. To be honest I was reluctant to see this. In recent years Cleese seems to be a curmudgeon always complaining about something and even Palin in his recent travel shows has become more croakier. However after a few minutes you get used to the older troupe and once the famous sketches and songs start to arrive you get into the spirit of the thing. There are a few ad-libs, a few forgotten lines and a little mischief here and there. The dancers make the whole thing a little more professional and although I believe that there were a few new sketches they were omitted from the uncensored repeat (I guess they will turn up as DVD extras.) We want to see the old hits. The dead parrot sketch, Spam song, Lumberjack song, Blackmail, Nudge nudge wink wink say no more.